Basal ganglia dysfunction is a problem with the deep brain structures that help start and control movement. A common cause of these findings is chronic use of medicines used to treat schizophrenia. Damage to the basal ganglia cells may cause problems controlling speech, movement, and posture. This combination of symptoms is called parkinsonism. 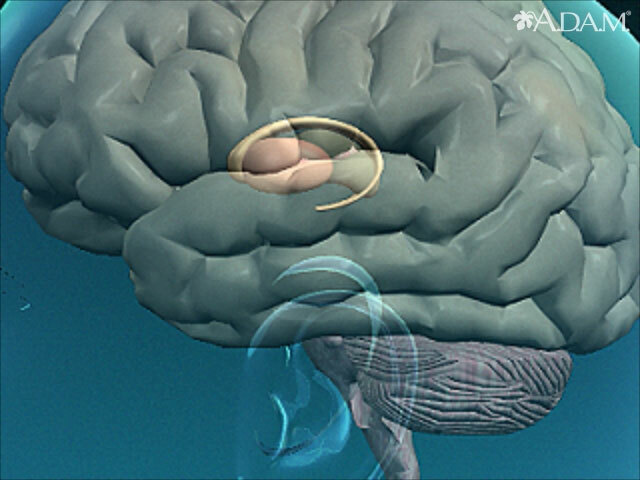 A person with basal ganglia dysfunction may have difficulty starting, stopping, or sustaining movement. Depending on which area of the brain is affected, there may also be problems with memory and other thought processes. The health care provider will perform a physical exam and ask about the symptoms and medical history. Call your provider if you have any abnormal or involuntary movements, falls without known reason, or if you or others notice that you are shaky or slow. Melnick ME. Basal ganglia disorders. In: Umphred DA, Burton GU, Lazaro RT, Roller ML, eds. Umphred's Neurological Renabilitation. 6th ed. St Louis, MO: Elsevier Mosby; 2013:chap 20.